A moderate modernist with beautiful touch and exquisite taste, Hank Jones was a beacon of gentle authority, genuine modesty and jazz grace at the keyboard. Oldest brother of the more unruly trumpeter-composer Thad Jones and drummer Elvin Jones, Hank epitomized balance, consistency and flexibility. It was a joy to be in his company, whether listening to him or speaking with him. I was lucky to interview him in tandem with pianist Geri Allen — generations apart, but both from the Detroit area — as published in my book Future Jazz, and to sit with him at length again in 2009 for Down Beat. 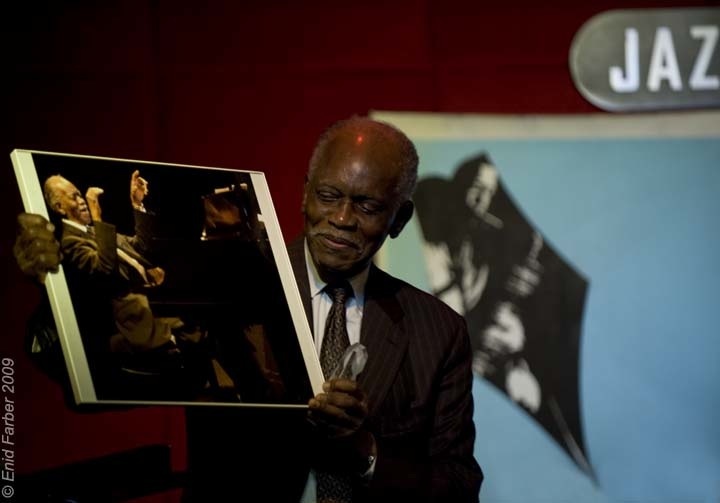 Here’s a photo by Enid Farber from the 2009 Jazz Journalists Association Jazz Awards of Hank with the picture of himself by Kris King that won the Award for Photo of the Year. What follows is my (long) article from my 2009 interview — with links to Amazon of some of his best albums, in case you’re moved, as I hope you will be, to hear him play . . .
Down Beat’s Hall of Fame. players. But one wonders: Who can keep up with Mr. Jones? (they issued Kids: Duets Live at Dizzy’s Club Coca-Cola in 2007). and siblings, his status does not rest on the achievements of a family band. he’s come from, what he’s done and how to continue. it. He’s been lucky and isn’t about to stop. be capable of every opportunity, collaboration and repertoire directed his way. on that thing. That’s what I believe, that’s what I have to do. say reach a point where you don’t think it’s necessary to practice anymore. skills. To me, that’s the only way to do it. and not even know where the time went. shape or you can’t play anything. That’s why it’s necessary for me to practice. and by the 1950s was much in demand. enjoyable Waller tribute album A Handful of Keys. attributes: the Hank Jones stamp of excellence, style and taste. piano players of my day. situation, even when I played Fats Waller’s music in Ain’t Misbehavin’. though. I try not to do that. together, you’ve got an Art Tatum. That’s how he was. where you vary the harmony, but you don’t get that far away from it. it and embellish as you go. one of the basic tenets of jazz is that you have to listen to what’s going on. to listen to what the other musicians are doing. current engagements (Mraz, John Clayton). besides make music, he pauses. We were talking about concentration, right? What does it take to concentrate? you see the results. It’s a very strong force. I don’t know what’s involved. But when you have it, you can hear it. If you don’t have it, you can hear it. At the 2009 Jazz Awards, Hank in accepting his statuette for Pianist of the Year mentioned that as far as his music went, he promised to keep trying. He had hopes that he would improve over “the next, oh, 25 years.” That is not to be — because it’s quite hard to improve on perfection. Thankfully, we have a lifetime of perfect pianism by Hank Jones to enjoy. A terrific piece about a memorable musician…thanks for sharing it online. It’s another beginning in another world. Thanks for a lovely interview with a great pianist and obviously a wonderful man. He died but he never grew old. At almost 80 years of age he recorded a superbly powerful African recording with Cheick-Tidiane Seck while never losing his more traditional jazz gifts of taste, touch and swing. Thanks a lot for letting Hank talk to us. His wisdom was as deep as his playing. A very inspiring article for all us youngsters. R.I.P. Hank Jones, who was a fine gentleman, and an outstanding musician, and piano stylist. As I read this sensitive story, I heard Hank’s gentle, intelligent, articulate voice. Thank you for sharing the interview in all it’s depth. Great insight in to a great man and musician who will be very much missed. I learned something special. Thanks. Thank you so much for this; the last of the Jones men is gone, and we are the poorer for it. I want to watch A Great Day in Harlem again. I recall he steals the movie by commenting on the weight of the other musicians, and it had me rolling on the floor the last time I saw it. What a classy, brilliant musician. Thanks for the great article,links and such for an unforgettable musician. He really WAS “Somethin’Else”. such a sad story for someone with so much talent and inspiration to be gone. Now is a time to send are condolences to his family and friends such a sad story.